Time is of the essence when water damage occurs on your property. Not only will you want to salvage your home and goods, but your insurance company will require a detailed inventory and assessment of your claim. With the stress of dealing with property damage, hiring a certified water damage and restoration company can help alleviate your burden. The technician will walk the property and access where the source of the damage originated. From a burst pipe to a sewage backup, a home evaluation will be key to finding the source of the damage. Once discovered the issue will be repaired to stop and prevent additional damage from occurring. Water damage can cause secondary damage, such as structural damage and mold and mildew growth. Mold thrives in areas with poor ventilation and excess moisture. within 48 hours, mold can spread and release spores causing additional growth, especially on porous surfaces such as drywall and wood. Mold can cause adverse respiratory issues and may exaggerate your body’s allergen response. Dark, discolored water should never be entered. This dingy water is filled with disease, animal feces, dirt, debris, bacteria, and fungi. Entering contaminated water can cause serious health concerns. While there are three categories of water pollution, water that has caused property damage may still be contaminated with debris and bacteria. Depending on the level of damage to your property, a pack out may be required to remove all water damaged items. This can include clothing, furniture, electronics and documents. Once removed the items will be catalogued. Any items lost will need to be reported to your insurance agency with detailed information to back up the claim. Additionally, items that are eligible will be salvaged through a thorough cleaning and drying process. 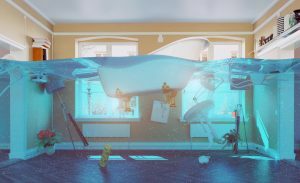 Ideally, as soon as the water damage is found on your property, you’ll want to inform your insurance adjustor right away. Your insurance company may be able to assist you in finding a restoration company to perform the remediation and restoration process. Be aware that their recommendation is just that; you’re able to hire any company to you’d like to complete the restoration of your property. Most restoration companies will assist you in filing your claim to your insurance adjustor. Keep in mind that there are different types of coverage and water damage differs from flood damage. You’ll want to be aware of your policy coverage to avoid any surprises. Living in South Carolina, we can be hit with extreme, adverse weather. If you live in an area prone to flooding, having flood coverage can save you from having to shell out for out of pocket expenses. When filing your claim, be sure to be specific indicating flood or water damage so your claim is filed correctly. Your policy may also specify the type of damage that is covered. Water damage as a result of failing to maintain your property, may not qualify for coverage. Familiarizing yourself with your policy will save you from additional stress should an incident occur.